Voting is open in Art & Books for NOW Readers’ Choice 2018! Please vote for URBAN GALLERY! 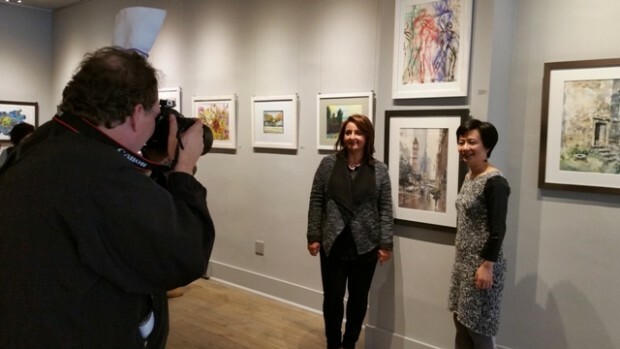 Charity event "Art With Potential"
Fariba Mirhosseini and Stella Dai are Canadian artists both working in watercolour. Their works are based on personal experiences abroad and at home in Canada — and while their styles are different from each other’s, their mutual love of colour and form brought them together for this exhibition. From village scenes in the Far East to the streets and landscapes of Canada, the artists capture these moments by painting what they see — and feel — in watercolour, and they hope it engages you to experience these as well. Fariba Mirhosseini was born in Tehran, Iran. Prior to being immersed into the field of painting and watercolor, she attained her post diploma degree in professional floral arrangement design at Seneca College. A novice in the world of painting and watercolour, her passion for colour combination and mixing of colours brought her to realize her potential as a painter. Stella Dai was born in Shanghai, China. Drawing has been her hobby since childhood. She studied sketch and coloring from a local art school and art institute in her leisure time. When painting, she immerses herself fully, which helps her relieve daily chaos and work stress. She turns to her painting as an essential way to deliver emotions and reflect her interpretation of life.